Physical Wellness – This category represents an individual’s physical health and includes things such as injury history, joint stability, and disease state. The goal in building strength isn’t necessarily to have optimum wellness, instead the goal is that your physical wellness doesn’t limit your expression of strength. For example one could have very strong muscles but if their knee joint doesn’t function normally that will limit strength. Of course if an individual has a terminal disease or even a temporary illness such as the flu that can affect their strength. The importance of this foundational piece is that you can’t express maximal strength if your physical wellness is significantly compromised. If one’s goal is to maintain a high level of strength over the long term, then one must maintain at least a basic level of physical wellness. You can’t win the game if you are sidelined with injury, and injury management and prevention are key aspects in staying strong throughout the lifetime. Adherence – This is the single most important controllable factor in building strength. If you don’t follow the program – whatever program it is, you will not make progress. You don’t get strong by accident. You need to show up and do the work. John Berardi has a famous 90% rule when it comes to nutrition – your diet should be on point 90% of the time. I think that same rule can apply to training. You should complete at least 90% of your scheduled workouts to feel like you are properly strength training. Effort – This means you simply work hard. You push yourself during the workout. It doesn’t matter if it is a set of 20, 10, 5 or 3, you push yourself. You don’t have to puke or almost die every workout, but you have try. Inherent in this is some form of overload. Most of your workouts this month should be harder than what you did 2-3 months ago. Most of your workouts 2-3 months from now should be harder than what you are doing now. If you are new to training you can start as light as you like as long as you regularly follow some sort of overload, it will become hard soon enough. Exercise Selection – Some might think this variable is overrated, I don’t. Strength is task specific, this is why the principle of specificity is one of the most fundamental principles in the field. I am assuming that you are using the standard definition of muscular strength, which is measured by one’s 1RM on big exercises that normally involve a barbell. If you have a different definition then you may come up with your own hierarchy but don’t use the word strength because you are using it wrong. You can blast away at the leg press, but if that is all you do when it comes time to squat you will be mightily disappointed. Push-ups are great but they alone will not build much of a bench press. A machine shoulder press and a standing barbell shoulder press are not the same animal. Back extensions and cable rows are fine but you might find the big weight stapled to the floor if you don’t train deadlifts. Exercise selection is key if you want to express your strength through resistance training. It is assumed that if you are using the proper exercises you are also using the proper technique on those exercises. Belief in Yourself – You have to believe in yourself, you have to believe that you can actually get stronger, in order for it to happen. Sometimes you follow a great program and start to make progress and that in turn fosters belief. Sometimes you believe and that helps you make progress and then you work harder on the program. One of my favorite quotes is: What man’s mind can conceive, in his heart he does believe, in time he will achieve. When I interviewed some of the best lifters on the planet for the book All About Powerlifting, the unifying theme wasn’t their training program or special diet or the way they peaked. The unifying theme was their unyielding belief in themselves. You can dismiss this if you wish, but do so at your own peril. Set, Reps, Rest, Intensity % – I call this the nuts and bolts of the exercise program. Of course if this is completely off it can negatively affect strength development, but as the second block labeled Effort shows training hard on the right exercises will make up for a lot of minor programming mistakes. But if you want to maximize your strength, you must train smart. Now the question is how smart are you training? Are you doing sets of 12 or 8 or 5? Is it volume enough to elicit adaptation? Is it too much or too little? Are you resting long enough for strength? In my opinion if you are training hard rest periods may be the single most important variable of these specific factors. Are you lifting the right weight? Is it too heavy, too light, just right? If you want more information about these variables for the big 3 barbell lifts, refer to the Henriques Squat, Bench, and Deadlift charts. Weekly Routine – This details how you structure your training week. Are you following a total body routine, a push/pull, or a once a week split? It really doesn’t matter that much if you are using the proper exercises, the main goal of setting up the weekly routine correctly is to prevent injury, usually in the form of chronic overuse injuries. Bad knees, bum shoulders, jacked up lower backs can occur if you don’t allow for adequate rest. If you decide you want to squat twice a week and deadlift twice a week, that is fine and dandy, but if you train squats on Monday and Thursday and deadlifts on Tuesday and Friday you are really training your lower back four times a week. Can it work? It can, but is it likely optimal? Probably not, and several months or years down the road you may be paying the price for that routine. Remember training works by damaging your body microscopically, then you repair that damage and in doing so you make your tissues bigger and stronger. Just like there is a time to pull off a scab and there is a time to leave it alone, so too there is a time to train a muscle again and a time to let it rest. The routine does matter some, but it likely doesn’t matter as much as many people make it out to. Nutrition – I am assuming that someone’s nutrition is at least adequate before addressing this. By that I mean they are at least eating a reasonable number of calories to support exercise and their bodyweight. Of course if you didn’t eat anything for 3 weeks it would affect your strength, but again I am assuming a base foundation is there. This section of the pyramid now means you are going to dial in your nutrition with an exact caloric intake and specific macronutrient breakdowns. We love to debate the minutia but it probably doesn’t matter that much if you eat 40%, 50%, or 60% of your diet from carbs; or 20 or 30% of your diet comes from protein. At certain points it will matter a bit more, but hopefully you are realizing that at this point in the pyramid the variables simply don’t matter that much. The most powerful way nutrition will affect your strength is by affecting your bodyweight. If you eat so much that you gain 20 lbs, you will almost for sure get stronger. If you lose 20 lbs, you’ll probably get weaker unless you had a ton of fat to lose in the first place. But the difference between eating a diet that contains 175 grams of protein and 200 grams of protein if the caloric intake is the same is likely negligible. Recovery Modalities – Another variable that has likely been overrated for strength athletes is specific recovery modalities, although that is not to say it literally has zero impact. This would include things like foam rollers, ice baths, saunas, massage, chiropractic work, etc. Obviously you can’t express your strength if you are injured, and if you have an actual injury (one that requires surgery for example) then the rehab for that area will be more important. If you are healthy and functioning well, these special recovery modalities only have limited value. In all likelihood if you believe they have lots of value, then as the pyramid shows the belief effect may be the stronger effect, rather than the actual restorative properties of the modality in question. Keep in mind these methods are often quite expensive and they are very likely not worth the bang for the buck. Supplements – The least important of all the variables, supplements might help a tiny bit, but I never thought I lost a powerlifting competition to a fellow competitor because he drank protein shakes and I didn’t, nor did I think I won a meet because I took vitamins and they didn’t. Most supplements are a crock of you-know-what to be blunt. Protein is convenient, vitamins and minerals might be useful, creatine might supply a small edge, that is about it. Supplements are the last thing a lifter should look at to improve their strength, yet they are often one of the first things lifters turn to because it is an easy change. Unfortunately (or maybe fortunately depending on how you look at it) life doesn’t work that way. Genetics – That is a tough one. It is something that we are still learning about and I make no claim to be an expert on genetics. Not everyone can be super strong. Very few people walk around super strong – as measured by a barbell – with minimal training. I’ll put my money on someone that has been squatting at least once a week every week for three years vs a “strong dude” who has never squatted before. There is only one way to know what your genetic potential is, and that is to devote your life trying to find the ceiling – your upper strength limit. The idea behind this picture is these are the main variables that affect you and that you can control. You can’t control your genetics so no matter where it is put in the pyramid, it doesn’t really change the importance of any of the other variables. Drugs – I am not sure? I don’t take drugs, I never have, and I don’t usually work with those that do. They do make a difference, of that there is no doubt. They likely affect different individuals differently. If I had to put them on the chart I would either put them above or below Belief in Yourself. Once again though I will happily bet on a drug free person who has squatted at least once a week every week for 3 years to out squat a drugged lifter who has never performed a squat. 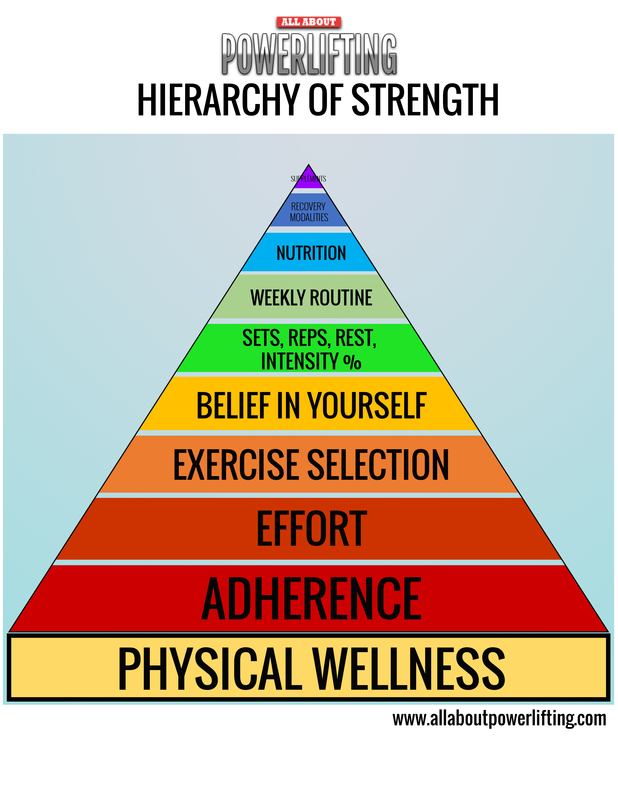 The idea behind the Hierarchy of Strength is to help you – the serious lifter – devote your time and energy to the things that matter the most. Stay healthy enough to train and avoid catastrophic injuries that can end your training career. Pick a program and follow it. Show up each and every day. Train hard. Spend your energy on exercises and activities that matter. Believe that you can accomplish your goals and that you can change yourself. Learn about strength training and follow a smart combination of sets, reps, load, and rest time. Select a routine that provides adequate frequency and still promotes sufficient recovery. Eat well to support health and exercise. Incorporate recovery modalities if necessary, and if you wish to include supplements as a part of your training consider them the finishing touches on your overall performance. Master the bottom levels before focusing your attention on the top of the pyramid.